Between skis, boots, poles, helmets, goggles, gloves, layers and outerwear (not to mention off-slope styles), you may have already talked yourself out of destination ski travel just to avoid a daunting airport experience. Make your ski trip stress free with these expert packing tips that could save you room, money and at the very least, save you from losing your mind. Be sure to check with your hotel to see if they offer any reimbursements for costs associated with ski and snowboard gear or baggage fees in general. Some hotels offer “checked bag credits” in the form of a discount at the hotel to help guests cover the costs of traveling with their gear. We know you’ll look good in that dress or those slacks, but will you really wear them? Mountain towns are typically very casual (and cold), and there’s no reason to lug around three pairs of shoes. For a long weekend trip, you can probably get away with wearing the jeans you wore on the plane to most dinners. Ditch the elaborate wardrobe in favor of practical and recyclable clothes. It sure looks bulky hanging there in your closet, but most snow gear is very light and moldable. Slowly fold jackets and pants, being sure to squeeze out all of the air. Pants can be rolled into the size of a coffee can and jackets can be folded down significantly. One trick: fold the jacket a few days before and put your suitcase on top of it. This will allow all the air to escape over time and prevent it from rising back up once placed in your suitcase. Airlines say you can’t have any additional items other than boots in your boot bag, but somehow we doubt they’re going to put up a fight if you have socks in there too. Most times you’ll probably get through without a problem, and in the case they do give you trouble, socks (and other small items such as gloves) can easily be transferred into another piece of luggage at the counter. You can save yourself some space in the suitcase if you’re trying to carry on. If you get busted, well... at least you tried! 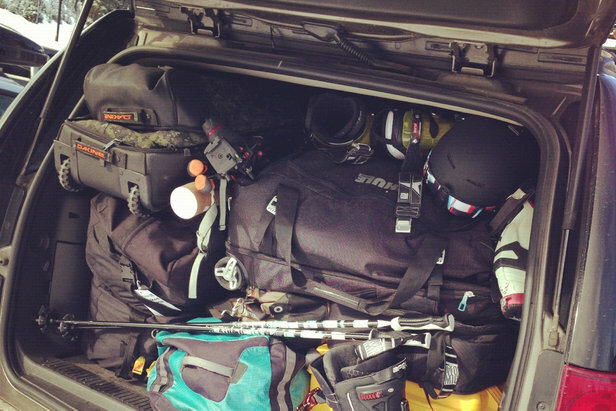 Boot bags aren’t allowed to contain anything else, but ski bags are fair game for extra items. Put as much of the little things in with your skis as you can—hats, gloves, socks—all the small things that would bulk up a small suitcase. If you put your jacket in the ski bag instead of your suitcase, fill the pockets with the above items to take advantage of unused space (but leave the pockets empty if you’re putting it in your suitcase. Filling the pockets will add bulk and prevent it from flattening out). Some destinations/hotels offer free or discounted rentals when you book lodging, so be sure to check around for coupons. Should I Ship My Gear? We’ve seen all the options for flying with gear, but what about shipping options? Showing up and having the gear already at the hotel is extremely convenient, but it is significantly more expensive and you obviously have to pack it all up at least a week in advance of your trip. Luggage Forward charges begin at $79 for a pair of skis or a snowboard one way within the United States. Other add-ons, such as precise pickup times and priority shipping, will tack on even more. Less hassle, but more cash. Such is life!